I am passionate about all things underwater and I specialise in getting colourful images of wildlife and shipwrecks in UK waters. I make my own 5 minute wildlife short films with my partner Jackie Daly who writes the scripts and narrates the story. I'm used to doing my own research, shooting to a story board and getting everything I need to bring a short together. I'm also a proficient editor so I have a great all round understanding of what it takes to make a film work. I filmed Puffins swimming underwater at 60 fps. I was commissioned for topside filming of my local Grey Seal colony . I also provided stock footage for above and below water. More than 10 minutes of my work was used across the Autumn and Winter episodes. Natural habitat and tank sequences of Sea Mice and their amazing spines and their role in science. I used a 5X macro lens for the spines in this piece. A short breakout sequence of underwater life in the Sea Grass off the beach at Studland. A 5 minute story sequence about the huge moulting aggregation of Spider Crabs in Pembrokeshire. 5 minute underwater story sequence and piece to camera about filming in macro underwater and capturing behaviour that is new to science. 5 minute underwater story sequence about Flame Shell reefs and piece to camera. I was commissioned by Off the Fence to film time lapse of limpets and tides in Kimmeridge Dorset. I was also asked to film using tanks to capture limpets teeth at 5x life size as well as filming fluorescence in snakelock anemones. I filmed a story about sea cucumbers in Loch Duich that was bought by the Watches team and went out as a 4 minute short. I sold a colourful sequence that I'd filmed at Muckle Flugga, the very northern tip of the Shetlands. I sold 30 secs of stock to the Watches team for a short story about seals predating Lumpsuckers at Flamborough Head. We made a 5 minute film for families for the EISF. I sold 30 seconds of stock for a short sequence in episode 1. A 5 minute feature about the discovery of Flame Shells in several Scottish Lochs. A 90 second version of our Arctic Charr film from Ennerdale. I filmed a 5 minute feature that followed the lifecycle story of the Cuttlefish at Babbacombe in Devon. I filmed establishing shots, courtship, mating, fighting, egg laying, eggs and hatchlings over a period of 12 months. 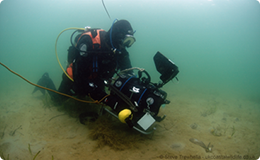 I provided 1 minute of footage for the feature on Brittlestars in Loch Sween. I supplied 2 minutes of footage of a trawler lost in the North Sea along with a lot of background information. I also appeared in front of camera in an interview at sea with Miranda Krestovnikoff. Expedition, Extreme Locations, Hand-held Documentary, HSE part 4 Scuba Diver, Night Filming, Open Water Dive Licence, Senior First Aid, Timelapse, Underwater, Underwater Cameraman. Keldan 8mFlux lighting, Sennheiser ME66 microphone and Rycote Softie, Equinox Housing - significantly tailored to my design, PXW-FS7 Camera, 7" Dive&Sea Underwater video monitor, Quad-pod with Ronford Baker F4 head, the head can be mounted on top or under-hung to get right down to seabed level, Canon 16-35, Nikon 70-180, Canon 24-70, Canon 60 Macro, Canon 100 Macro, Canon MP-E 65, Sigma 50-500, Sony 28-135 kit lens, Metabones Sony E to Canon MkIV, Metabones Sony E to Canon Speed Booster Ultra.